By demand we have our new home cinema speakers created specifically for discerning ears that do not compromise in quality, power and sound pressure. The power of 300 W RMS make these home theater speakers a milestone of Garvan products. With our central channeled flat diffusers and their D’Appolito configuration you can realise a fantastic personal home entertainment center. In the continuous search to satisfy every need, Garvan surprised people giving the opportunity to make full optional sound systems without making any structural changes, by creating a series of steel flat speakers ideal for installations on walls and ceilings. 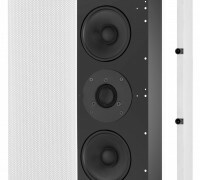 The loudspeakers used in this series are the same used in the in-wall and shelf series, with the exception of SNW210 (available only for this series and shelf series), which with the depth of only 39 mm and its low aesthetic impact is ideal for sound design environments. Standard white cabinets of all the series have a fixative coating to give the possibility to be painted with the same colour of your walls. Available on request you can find cabinets in brushed or lacquered steel and with different aesthetic steel finishes either polished, satin, lacquered or customized according to your wishes. The speaker is the same series of in-wall and plasterboard, secured with powerful neodymium magnets that provide the ability to fit perfectly flush with the wall. Garvan, thanks to the practical mounting system of the aesthetic and the wide possibilities to customize the speakers, creates solutions for every need.